Thx guys. Shop is always open...there might be a fridge on the other side of the shop with cold beverages....for after work! 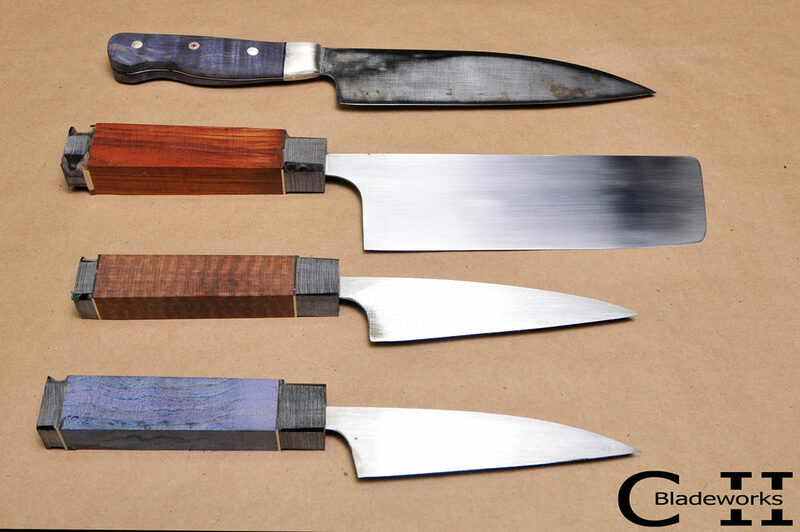 Here are some knives nearing completion that will be available for purchase soon. 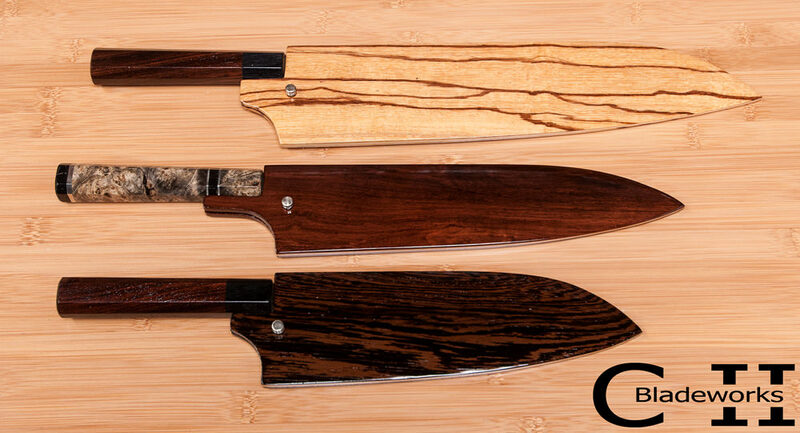 From the top down: 245mm KS style gyuto with ebony and nickel-silver handle, 180mm nakiri with a royal palm handle, and a 155mm tall petty with a redwood burl handle. The blades are 52100 carbon steel at 62/3HRC. Here are a couple of tall petty's (approx 36-37mm tall) that are shipping out today. Both are 52100 carbon steel at 62HRC. The top knife with the K-tip is 160mm and has a dyed and stabilized buckeye burl handle with buffalo horn and nickel-silver accents. 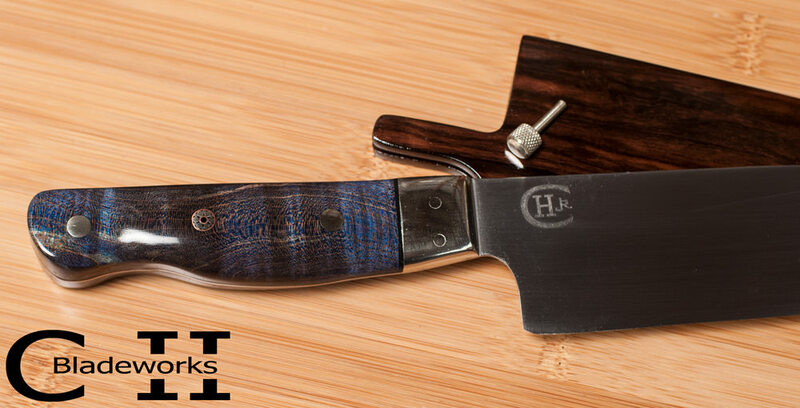 The bottom knife is 150mm and has a dyed and stabilized maple burl handle with horn and nickel-silver accents. 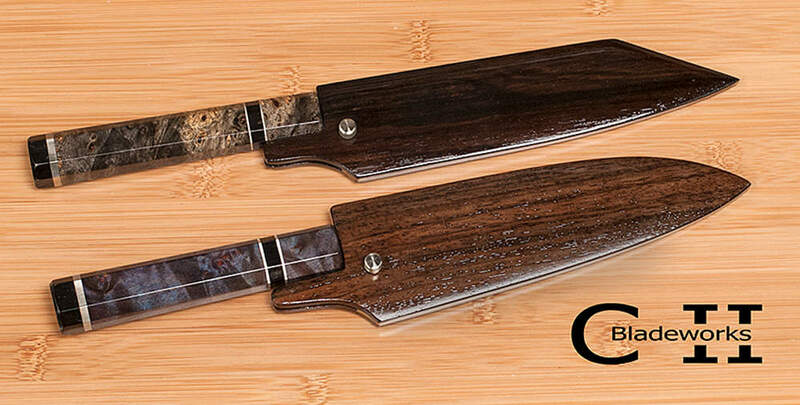 Made a mistake in the original posting....the top saya is Indian ebony and the bottom is East Indian rosewood. I've been busy out of the shop for the past few weeks and a little slack on posting, but here are a couple of projects that I'm wrapping up. 3 sayas and one custom handle. 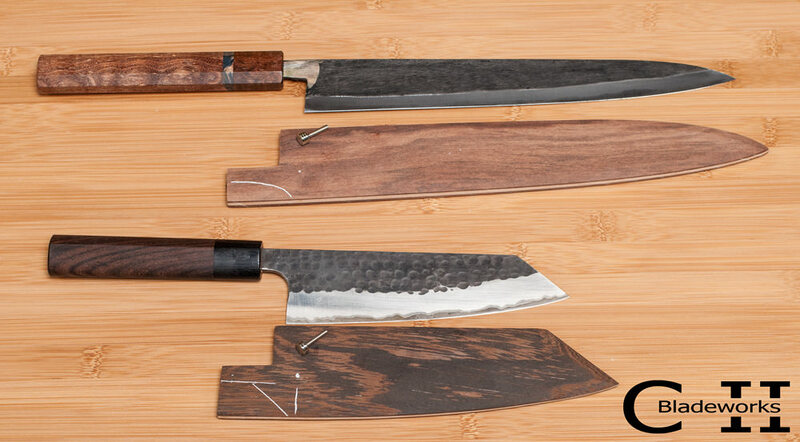 The handle is on an Anryu 240mm hammered gyuto, the 2 other sayas are for Takaeda's. 2 more sayas for a Moritaka and an Anryu. The finished sayas....top is Granadillo and bottom is Wenge. Great looking work as always! 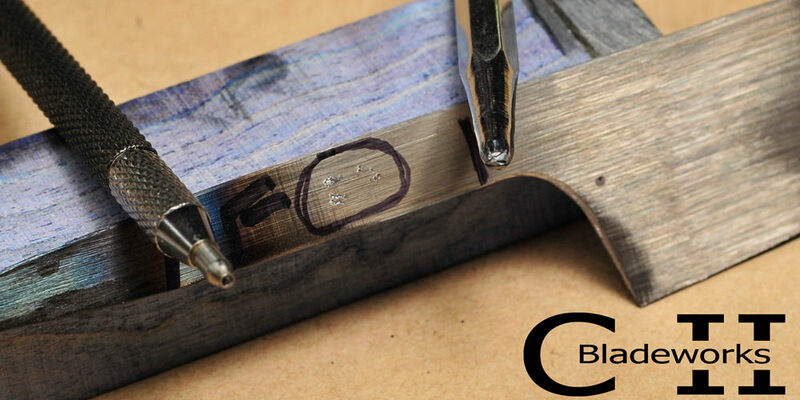 What finish are you using on the sayas? Thx buddy....TruOil is my go to finish, usually 5-8 coats depending on the wood. On the Wenge, I applied several coats of CA to fill grain and micro cracks, then TruOil. Well Carter...your work is looking pretty subpar, might be time to retire. 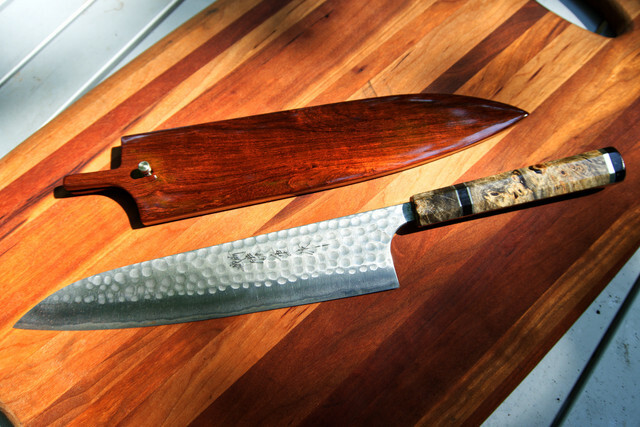 Here are some glamour shots of my Anryu 240 with handle/saya from Carter. 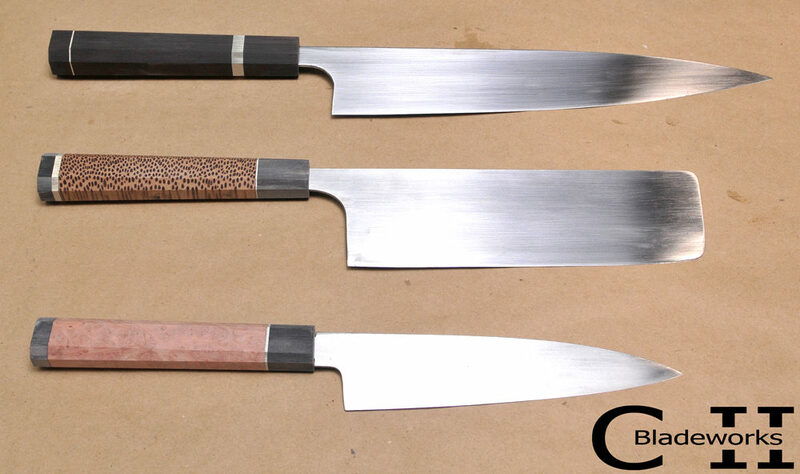 Here are 4 knives on the bench this week, a western handle 185mm Funayuki, a 180mm Nakiri, and two 130mm tall Pettys. This is how tough my blades are...I was trying to mark one of the Petty's in the photo above....I used a hardened steel and a carbide tipped punch, both tips broke off and I was just using a very small 5oz tack hammer to strike the punches with. I would love to sell a couple knives for you at some point. Thanks Mark....will reach out to you offline. A couple of 130mm pettys in 52100. 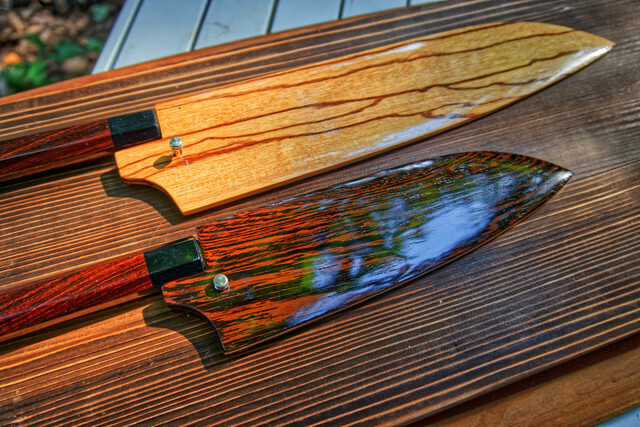 Handles are dyed maple burl and snakewood. This is a western handled 180mm funayuki in 52100 carbon steel. 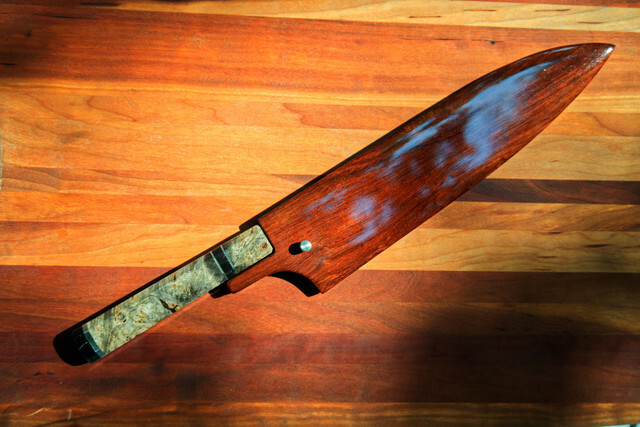 The handle is Oregon maple that has been dyed and stabilized, the bolster and pins are nickel-silver. The saya is Indian ebony with a knurled nickel-silver pin. 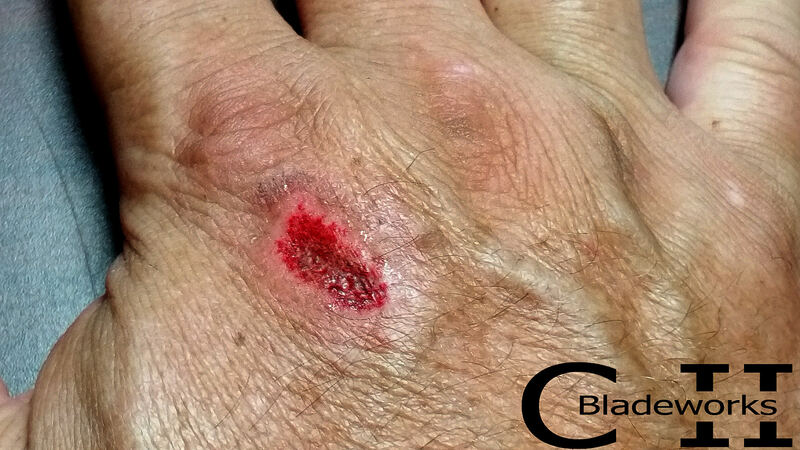 Knuckle vs 36 grit ceramic belt.....about .5 nano second contact. Just one of many...fortunately they are less common now, but every now and then the grinder bites. I'm like the dad in "My Big Fat Greek Wedding", I spray some Windex on it and wrap it with a shop towel and blue tape....good to go! No it doesn’t take long at all. I don't like wearing gloves for safety reasons, not the that knife grinder is too dangerous for a gloved hand like some of the other machines....but still. The other reason for no gloves is to be able to feel the heat build up in the blade, this is important after heat treating and tempering. I actually was not grinding when this happened, I was clearing out a big steel "dust bunny" in my dust collection hose right beneath the grinder.....when I pulled my hand out, I hit the lower contact wheel on the flat platen attachment.....one of those deals where I was not paying full attention, because I was not using the grinder per se.